During Partner Exchange I had quite a few discussions with people about the default vCPU setting when creating an Org vDC with a Pay-As-You-Go allocation model. Now this is nothing new however this is still causing quite a few performance issues out in the field. When creating a new Org vDC through the wizard, after selecting the allocation model Pay-As-You-Go, you are shown the configure window. This window allows configure the compute requirements for this Org vDC. This is where the gotcha comes in. The default setting vCPU is configured at 0.26 Ghz. I will repeat this as I know I have missed it in the past. The default setting for vCPU is 0.26GHz. You can see in the screenshot below the default setting. So how does this actually relate to the objects in vCenter? By leaving this set to the default, this will configure every VM you create with a vCPU limit of 0.26GHz. The screenshot below shows the vCPU limit configured in vCenter. If you experience any performance issues running VMs from vCloud Director, it is always best to check the Org vDC vCPU settings in the first instance. To read an in-depth guide about vCloud Director Allocation models read the article by Duncan Epping at Yellow-Bricks. Alan Renouf is currently in the process of writing a vCloud health check PowerCLI script to run alongside his vCheck script. To find out more about these scripts click here. What should the values be instead? 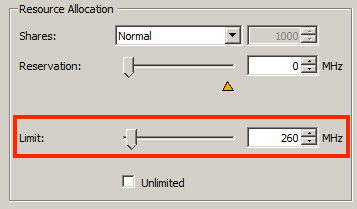 The setting should be configured for the required amount of GHz for a vCPU within the Org vDC. This setting applies to every vCPU you assign to a VM.